We made it to half-way! We’ve raised $26,134 for the GBS/CIDP Foundation that will go a long way to helping those with Guillane-Barre Syndrome and related conditions. Thank you again to all of you! Weekly stats: we’re 50% of the way to the $52k goal, and still 33% of the way to the goal of running 52 races. My good friend and former colleague Suhail Ansari generously donated $250. He’s opted for the “train or run a race” perk — one of my favorites — and I’m looking forward to seeing when he’ll take it up! My very good friend Rebecca Brown and her personal training company Pure Forme Training (give them a Like if you’re in Washington state!) donated $100 too. That’s wonderful news too! Thank you to both Suhail and Rebecca! And, well, there hasn’t been enough racing, that’s for sure! I’ve tried to register for two races here in Buenos Aires and they’ve both been sold out. You wouldn’t believe how popular running is here in Argentina, and how large the races are — most seem to be capped at 10,000 or more, and sell out with no problems at all. 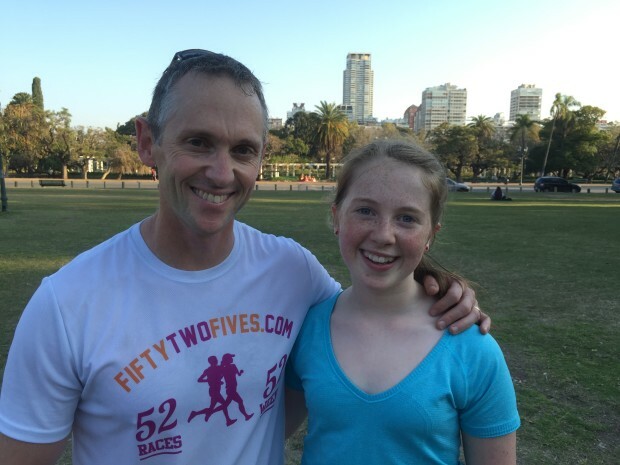 So, instead, we’ve been just running around the parks in the city and enjoying ourselves — here’s a photo with my daughter Lucy in a Buenos Aires park after some running and Frisbee!